The Colorado Workers’ Compensation system established in Article 41 of the Colorado code provides broad coverage to injured workers for their medical benefits. For instance, according to 8-42-101, employers must provide ” medical, surgical, dental, nursing, and hospital treatment, medical, hospital, and surgical supplies, crutches, and apparatus,” that are reasonably necessary for you to be cured and relieved of the effects of a work injury. While this law seems to ensure that you will get the medical care you need after a work injury, the law also allows the workers’ compensation insurer to determine what doctor you will see. The fact that the insurance company chooses your doctor can create significant problems if the doctor focuses on cost-cutting for the insurer rather than on getting you better. As such, if you believe that your doctor is not looking out for your interests or not providing you with the medical care you need, you must take action. The Boulder workers’ compensation lawyers at the Dominick Law Firm have assisted clients in Boulder, Longmont, Louisville, Lafayette, Erie, Broomfield, Greeley, Ft. Collins, Superior, Denver and the entire Colorado front range with Denver workers’ comp claims. Contact us today at (303) 447-2644 or using our online form for a free consultation to learn how we can help. When you suffer from a work related injury, it is important to notify your employer immediately so that you can ensure that your workers’ compensation coverage pays for your medical bills in full. When you notify your employer of your injury, your employer must give you the names of two different physicians to choose from. After you select a physician, that doctor becomes your authorized treating physician. You are permitted one switch of your authorized treating physician (ATP) within 45 days of your injury, but otherwise you must consistently go to see the doctor that you selected. If your employer does not provide you with this list of doctors to choose from, you can select your own physician- but often this does not happen. The ATP you see for your work injury will recommend a course of treatment that the insurance company can either approve or can deny (at which time an independent medical expert would evaluate your case). The physician will also determine when you have reached maximum medical improvement and when you are cleared to return to either full or partial duty at work. Unfortunately, in many cases, the doctor that your workers’ comp insurer sends you to has a strong loyalty to the insurer since that is who is sending him business and paying the bills. This means that the doctor may make decisions on your treatment, as well as on when to release you, with the needs of the insurer on his mind rather than your own need to get the best medical care possible. If you believe you are not getting proper treatment or that the workers’ compensation insurer is not paying the full medical and other benefits that you deserve, it is up to you to take action. You can get help from a Louisville workers’ compensation lawyer who will assist you in requesting a hearing before an administrative law judge (ALJ). The judge can review the information presented and make a fair and reasonable determination regarding the treatment and medical benefits you are entitled to. 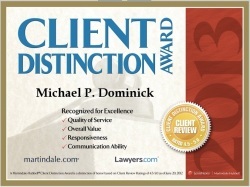 The Boulder workers’ compensation lawyers at The Dominick Law Firm have represented countless clients in disability hearings and when negotiating with insurance companies to get the medical benefits they deserve. If you live in Boulder, Thornton, Longmont, Louisville, Lafayette, Erie, Broomfield, Lyons, Mead, Loveland, Wheatridge, Greeley, Ft. Collins, Superior, Denver and the entire Colorado front range and need assistance with your disability claim, contact us today at (303) 447-2644 or using our online form for a free consultation to learn how we can help.